Trevose, Pa – Lenox Instrument Company’s Micro Borescope delivers a clear, bright image ideal for close-range test and inspection of medical devices like coronary stents, tubing, micromolded, machined and cast parts and electronic and mechanical assemblies – particularly where access is limited and the insertion point is only a few millimeters in diameter. Micro Borescopes from Lenox feature a focusing eyepiece and a fiberoptic bundle that provides superb resolution. The scopes’ rugged design and durable construction give them superior ability to tolerate tip deflections and moderate bending. Additionally, the Micro Borescope is backed by Lenox’s industry-leading two-year warranty. 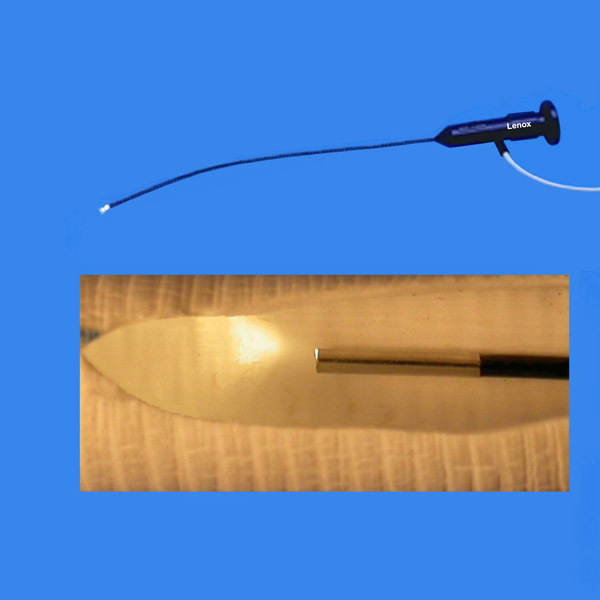 The Lenox Micro Borescope comes in both flexible and semi-rigid models. The scope itself is available in diameters as small as 0.02 inches (0.5 mm), and in standard lengths from 4 inches (102 mm) to 50 feet (15.2 m). Other lengths and custom configurations are available, as well. All models in the Micro Borescope line are fully video-and digital-adaptable, allowing for the viewing and recording of real-time or still images for reference. Micro Borescopes are compatible with other Lenox accessories such as complete color video systems and light sources (standard and portable versions) for self-contained illumination of the inspection area.